Miyazu (宮津市 Miyazu-shi?) is a city located in Kyoto Prefecture, Japan formally founded after the Second World War and with a population of just over 20,000. It is twinned with Nelson in the South Island of New Zealand which has a similar, but much longer, natural bar. Miyazu was established as an open port for trading with the United Kingdom and United States by imperial decree in July 1899. The 2 mile long sand bar that is called Amanohashidate is such a popular sightseeing destination in Japan for both domestic and foreign visitors, that many do not even know the name of the city that contains it. Because of this it has its very own railway station. Amanohashidate Tourist Information Centre is inside Amanohashidate train station. Open daily 09:00-18:00. The official tourist information centre has information, including a map and brochure, in English and helpful staff. Free Wi-Fi available. Coin lockers are available outside of Amanohashidate train station. Price depends on size of the locker: ¥300-500. Direct Hashidate (はしだて) limited expresses run four times a day and connect Kyoto Station to Amanohashidate in 106 minutes (¥4,310). Alternatively, connect at Fukuchiyama (福知山) or Nishi-Maizuru (西舞鶴) to the Kita-Kinki Tango Miyafuku Line (北近畿タンゴ宮福線); you can manage the trip with local trains for as little as ¥2,200, but this will take over three hours and require several transfers. If you like to use the local trains to visit Amanohashidate, Hyperdia provides train connection searches in English. The Amanohashidate station is on a spur line off of the main line to Miyazu. Don't be surprised as the train stops completely in Miyazu, changes direction, and then turns onto a separate line toward Amanohashidate. NOTE: Japan Rail Pass holders must pay additional surcharges to visit Amanohashidate. Hankyu Sanbangai bus terminal 阪急三番街高速バスターミナル run by Tankai bus company（丹海バス). It takes about 2.5 hours. Price: ¥2600 (one way, per person),runs 3 times in a day. You can also catch this buses from Shin-Osaka (Shin-Osaka bus terminal 新大阪駅バスターミナル), price is the same. There are also two of the buses will depart and drop you off at Osaka Itami airport(大阪・伊丹空港) which is a domestic airport. The small villages on both the north and south sides of the land bridge are easily walkable by foot, as distances are short. In the village of Monju (文珠) on the south side of the land bridge, the train station is only a few hundred feet from numerous ryokan, restaurants, dried fish shops and souvenir shops. One can rent a bicycle at one of the many bicycle rental shops around Amanohashidate to ride across the land bridge and bike to surrounding local tourist spots. If you prefer motorized transport, small motorboats transport passengers between the north and south sides of Amanohashidate. The boats are inexpensive and take 5-10 minutes to travel the length of the land bridge. On the south side of Amanohashidate, the boats dock near the Shinto shrine. Local trains are run by Kitakinki-Tango-Railway(KTR北近畿タンゴ鉄道). Around Tango-yura(丹後由良) station, is one of the best scenic spots of the KTR line. Amanohashidate (天橋立), the meaning of which is roughly bridge in heaven, is a 3.6km long, pine tree covered sand bar. It spans across Miyazu Bay on the Tango Peninsula, northern Kyoto Prefecture. It is ranked as one of Japan's three most scenic views. The canonical way to view Amanohashidate is to turn your back to it, then bend over and look at it upside down from between your legs — this is supposed to make the bridge appear as if it floats to heaven, and bring good luck. About the only other thing to see near Amanohashidate is the land bridge which is best viewed from the hillside on either the south or north side of it. On the south side, there is a chair lift and cog wheel-type train that one can ride up to a viewing area, where there is a small amusement park. On the north side, there is a chair lift and an electric train/trolley that take visitors up to a viewing area, where there is a small coffee and snack shop. Purchase tickets at the bottom of the lifts. They are well-marked and easy to locate. The rotating bridge on the south side of Amanohashidate is unique, although it is by no means a must-see. Rather than raising like a traditional drawbridge, the middle section of this bridge rotates 90 degrees to allow boats to pass through. 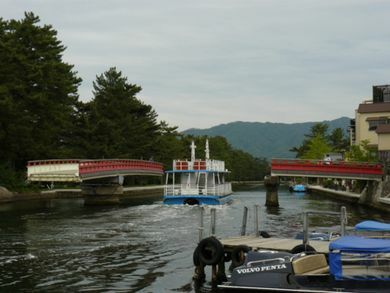 The bridge is located near the temple and boats that transport visitors to the north side of Amanohashidate. Chion-ji temple(智恩寺) is known as one of the three Monju(God of wisdom) in Japan. People wish to gain wisdom at this temple. The temple is open 9:00-17:00. Admission free. 5min walk from Amanohashidate train station. Motoise Kono shrine(元伊勢籠神社) is the home of Ise-jingu shrine(伊勢神宮) in Mie prefecture. Five coloured balls placed inside of shrine that you can see only in this temple or in Ise-jingu in Japan. About 25min by bicycle from Amanohashidate train station. Nariai-ji temple(成相寺) is located in a mountain and originally built in 704. The temple has 5 storied pagoda as well. From Kasamatsu-park you can take a mountain bus (Return trip ¥700 and admission to the temple is ¥400. The mountain bus runs every 20min April to October 08:40-17:00. The mountain bus from the temple runs every 20min April-October 08:50-17:10. The temple is open 08:00-16:30. Swim on the sandbar in the summertime while eating dried squid. Stay overnight so you can get up early (06:00 in Oct) and watch the cormorants & mist lift with the sunrise to reveal the pristine sandy bar that is the Bridge / Passage to Heaven. Plus if you're quite lucky - you might meet a sumo wrestler! Be judicious about your hotel or ryokan, there are some with outdoor tubs on a second floor balcony and some with no view at all. Cycling Many rental bicycle shops around Amanohashidate train station. Rental fee: average ¥400/bike within 2h. Amanohashidate sightseeing boat (天橋立観光船): You can see Amanohashidate from the sea, the boat runs along Amanohashidate. The boat ride is 12min between Amanohashidate (train station side) to Ichinomiya(opposite side of Amanohashidate). Frequency: every 30min (during weekdays), every 20min (during weekends). The boat fare is ¥520 single, ¥940 return. It's also possible to take a boat trip to Miyazu although only once in a day. Chie-no-yu (智恵の湯): This is a small hot spring spot located next to the Amanohashidate train station. No mixed bath. 700yen/person. Open: 12:00-22:00. Last admission time 21:00. Closed: every Wed(except Public Holidays). Amanohashidate-winery (天橋立ワイナリー):This is a young winery since 1999, 10:00-17:00(winery&shop), 11:30-14:00(restaurant),closed on WED. FREE entrance and tasting!! Direction:20mins ride by bus(towards Ine,伊根方面行）from Amanohashidate train station bus stop and get off at "Amanohashidate wainari-mae"(天橋立ワイナリー前). Hakurei(ハクレイ): Japanese sake brewery. FREE 30mins brewery tour(Reservation necessary). Access: from Amanohashidate station take a train and get off at "Tango-Yura(丹後由良)" and walk few minutes. Uocchikan (魚っ知館): Aquarium which has about 300species and 6000 sea creatures you can see. There are also penguin and harbor seal. Feeding time(about 10mins): 11:00/13:15/16:00 Open 9:00-17:00,closed on WED&Thursday(except public holiday). Admission 300yen/person. About 1hr bicycle ride from Amanohashidate train station, good cycling path available! This is not a big aquarium but nice place to visit if you like to see fish and sea animals closely and slowly because usually there is no crowd. Ouchitouge-ichijikan-kouen(大内峠一字観公園): Look-out point c. 40min by bicycle from Amanohashidate train station. About 20mins steep winding mountain road. Be careful for cars. Amanohashidate Sesshukan viewing point(天橋立雪舟観展望所): 25mins by bicycle from Amanohashidate train station. If you visiting in mid-April, the view point is covered by azalea! Very beautiful with vivid colour of the flower. Designer's train The train is designed by a famous industrial designer Eiji Mitooka(who designed one of the Japanese bullet train as well). The train started run from 14th April 2013. Two different coaches, one is blue (called Aomatsuあおまつ) and another is red(called Akamatsuあかまつ). If you would like to take Akamatsu 300yen/person extra charge. The train is run by KTR(北近畿タンゴ鉄道). Dried seafood, chirimen fabric, sake flasks made from a dried squid. Rice vinegar from Iio-jozo(飯尾醸造) This vinegar company has more than 100 years of history and their vinegar is organic. They even farm the rice which is used to make the vinegar. They also have other flavours of vinegar, like a fig vinegar, pomegranate vinegar, black bean vinegar etc. Oil sardine from Takenaka kanzume(竹中罐詰) High quality and beautifully packed sardin in a tin. You can eat it simply without adding anything or even you can use for pasta, salad as well. The oil sardine is also well-known as nibbles when people drink alcohol in Japan. Nishigaki(にしがき)Normal supermarket located in Fuchu area(府中). Daily 09:30-21:00 Located opposite side of Kono-shrine. Kiosk(キオスク)located inside of Amanohashidate train station. Open during the day. Crab(Matsuba-gani松葉がに): One of the most popular cuisine from this area in winter season between beginning of Nov to end of March. Many Japanese people travel to eat this crab. Expensive but tasty! Japanese amberjack(Kanburi寒ブリ): Many different way to eat this fish, but in this area especially eat as Shabu-shabu(しゃぶしゃぶ) is popular. Only in winter. In the summer, don't miss the melon ice from the little snack shop on the northern slope's viewing area. (Chie no mochi)智恵の餅/Sweets: It is a sweet, rice cake with red bean paste. Eating this sweet is believed to give wisdom to people. There are some local wineries. There are many ryokan serving local seafood. Ask at the Amanohashidate train station's tourist information stand for information or to make a reservation. Prices range ¥10,000-25,000 per person per night. Amanohashidate Youth Hostel. If you want to hire an entire room for your group, it costs an extra ¥2,000 per night per room. You can also take breakfast for ¥600 and dinner for ¥950 but a reservation is required. Rental bicycles are available at the hostel and you can contact them in English. With IYHF membership, a bed in a 4-8 person dormitory is priced at ¥2,650 (non-members over 16 years pay ¥2950). No mixed dormitories are available. Ine(伊根):(boat-house village) About 50min by local bus from Amanohashidate station. Bus fare: ¥400 single. Kyougamisaki(経ヶ岬):This is a lighthouse which located at the northernmost end of the Tango peninsula, and is one of the three [ Japanese ] major lighthouses. About 2hrs by local bus from Amanohashidate station. Bus fare:400yen/single. From the bus stop, about 30mins walk to the lighthouse. The bus runs only 4 times per day from Amanohashidate station. Ukawa ONSEN-Yoshinonosato(Hot spring)(宇川温泉よし野の里) Official website in English About 2hrs from Amanohashidate station by local bus. Bus fare:400yen/single. The bus runs only 4times per day. Bus runs all the way up to Tango peninsula on the coast. The bus arrives exactly to the spot. At there, possible to have a lunch, dinner and overnight stay. This page was last edited on 21 March 2019, at 00:16.